NEWPORT BEACH, Calif.--(BUSINESS WIRE)-- Green Automotive Company's (www.thegreenautomotivecompany.com) (OTC:GACR) subsidiary, Newport Coachworks, Inc. (NCI), yesterday delivered the first of the 432 buses ordered from its major customer Don Brown Bus Sales Inc. 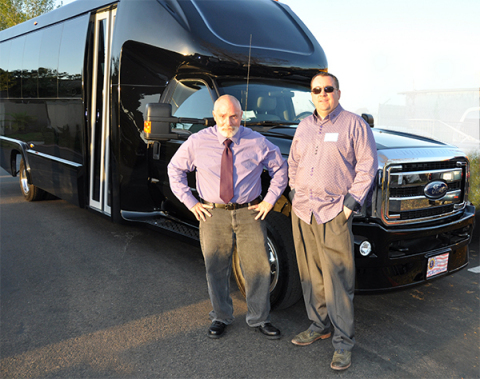 The handover of the high quality "all American" shuttle bus took place at the GCLA (Greater Californian Livery Association) meeting in San Diego. Last November Newport Coachworks signed a distribution agreement with Don Brown Bus Sales, one of North America's leading bus distributors, to manufacture a range of buses over the next 2 years. To meet this demand, the company invested heavily in its new state of the art production facility based in Riverside, California. Carter Read, President of NCI confirms: "We have invested in the most technically advanced machinery such as a 5 axis CNC machine and a full length spray booth and oven for painting even the longest buses, to make sure we meet the highest quality standards. The first bus that rolled off our production line, the Atlas 27, combines high rigidity with optimized weight and maximum durability thanks its innovative fiberglass body, fully composite floor and high strength light weight frame. A good day for manufacturing in America!" Don Brown Bus Sales General Sales Manager AJ Thurber is delighted: "This is the first of a new generation of shuttle buses which we believe are set to take America by storm. Its elegant design will inspire passengers with an outstanding ride and comfort level. Mr. Read has proven the superiority of his technology that leads to a longer life for the buses, greater pleasure for the passengers and higher levels of safety. We are amazed at what Newport Coachworks has been able to achieve in such a short period of time." Green Automotive Company is a state-of-the-art niche vehicle design, engineering, manufacturing, and sales company, driving innovation in the use of cutting edge zero and low emission technologies. Green Automotive Company possesses a unique portfolio of synergistic and innovative businesses that are active in 3 main market segments: Advanced vehicle technology development, engineering & design with a focus on zero and low emission solutions; Manufacturing and customization of vehicles for niche markets with the potential to be converted into low emission or electric vehicles and Distribution of sustainable transport solutions including a comprehensive after sales support program maximizing the life time value of all vehicles. Our 3 main divisions servicing these 3 segments are Liberty Electric Cars Ltd , Newport Coachworks Inc and GoinGreen Ltd. Green Automotive Company shares are traded on the OTC QB under the symbol "GACR". For further info, visit www.thegreenautomotivecompany.com. Safe Harbor Statement - This release includes forward-looking statements. Statements contained in this release that are not historical facts may be deemed to be forward-looking statements. Forward-looking statements are inherently uncertain. Actual performance and results may differ materially from that projected or suggested herein due to certain risks and uncertainties including, without limitation, ability to obtain financing and regulatory and shareholder approvals for anticipated actions. Such statements are based on management's current expectations and are subject to certain factors, risks and uncertainties that may cause actual results to differ materially from those referred to or implied by such statements. In addition, actual or future results may differ materially from those anticipated depending on a variety of factors, including the "risk factors" listed in the company's public filings with the Securities and Exchange Commission. . Readers are cautioned not to place undue reliance on these forward-looking statements, which speak only as of the date hereof. Green Automotive Company incorporates by reference its disclosure and financial statements posted on www.otcmarkets.com and filed with the Commission, and does not intend to update any of the forward-looking statements after the date of this release to conform these statements to actual results or to changes in its expectations, except as may be required by law. The article Green Automotive's Subsidiary Newport Coachworks Delivered the First of 432 Buses at the GCLA Meeting in San Diego originally appeared on Fool.com.